Peter spoke of the work Team Tanzania are doing in Tabora. He is a charismatic speaker and story teller and gave us many examples of how, by spending very little, his team were able to do so much in various areas. It is sad to think that so many of the children go blind- partly because of their belief in the Medicine Man and going too late to receive help from Western Medicine. And it is only a small thing but Team Tanzania provided several hundred white sticks and one young lady summed up the help this has been to her – she said ‘I am no longer invisible’ – people are able to see that I might need help and I am no longer ignored. Team Tanzania have also ‘lined’ many wells and provided pumps as well as appointing ‘officials’ to look after the Wells and the water. Clean water means a healthier life style. Peter was inspirational and proved how much can be achieved with relatively little financial input. 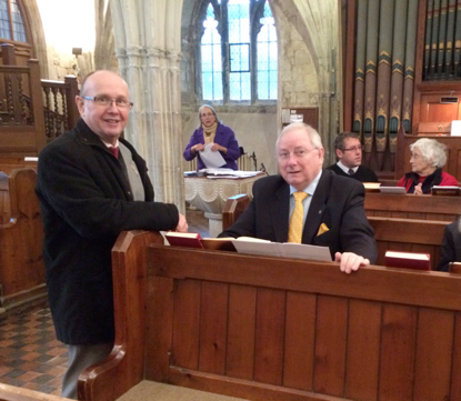 Anne Oakley presented the Sunday collection to Peter and other members of the congregation added to the amount to help Peter and his team ‘keep up their invaluable work’.